Product reviews that now include pricing transparency for members via our member-exclusive LearnPlatform Portal. Online community membership, including our private network in a research-backed platform to help our members better discover, procure, and evaluate technology. Data collection tools and dashboards for analyzing software utilization in member schools. Program discounts on our annual conference, professional development offerings, and our Aspiring and Early Career Technology Director Institute (ECATD). Access to ATLIS’s database of annual survey data from schools on trends in technology usage. Access to our extensive document library sharing templates and example documents. Ongoing professional development for the entire technology office and other senior administrators, including free webinars and newsletters. Job board posting privilege, job postings are visible to the public. Inclusion of technology-related school workshops and events on the ATLIS calendar, visible to the public. Discounted or free access to resources and programs with partner tech organizations, such as our Mock Phishing Exercise. Pricing is based on enrollment, with a fee of $3.00 per student in grades K-12 with a cap of $2750 regardless of school size. Recognition and logo placement on the ATLIS website in two locations. Discounts on our annual conference exhibit opportunities and registration. A ¼-page ad in Access Points, our annual journal, discounts on additional advertising. Discounts on the ATLIS certification from iKeepSafe. Discounted promotional opportunities in other ATLIS digital and print publications. Job board posting privileges (job postings are visible to the public). Inclusion of technology-related workshops and events on the ATLIS calendar, visible to the public. 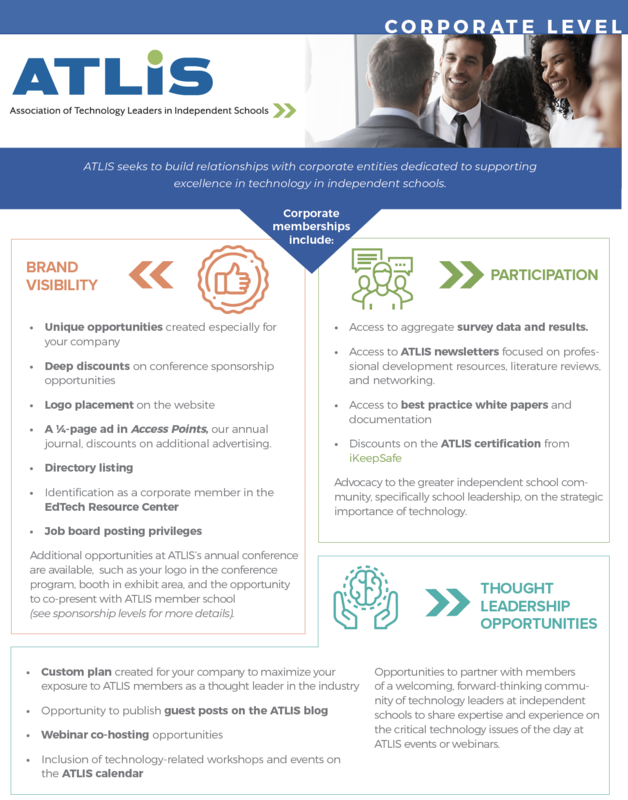 Opportunities to partner with members of a welcoming, forward-thinking community of technology leaders at independent schools to share expertise and experience on the critical technology issues of the day at ATLIS events or webinars (preference is given to corporate members over nonmembers when selecting presenters). Opportunity to publish guest posts on the ATLIS blog (preference is given to members over nonmembers when selecting posts). Access to aggregate survey data and results. 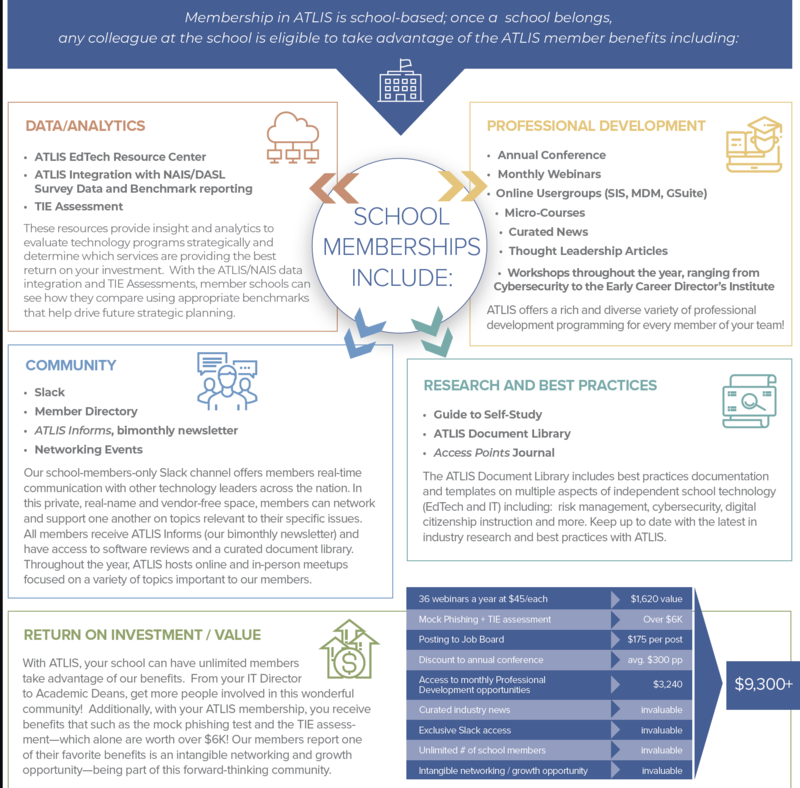 Access to ATLIS newsletters focused on professional development resources, literature reviews, and networking. Advocacy to the greater independent school community, specifically school leadership, on the strategic importance of technology. Corporate Membership in ATLIS is priced at $1500.